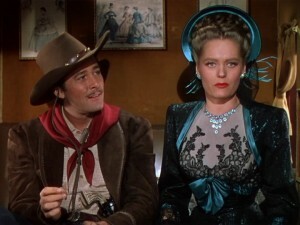 This is the first of two westerns teaming Errol Flynn, Alexis Smith and S.J. Sakall (the Hungarian character actor best known as Karl the waiter at Rick’s Café Americain in Casablanca). 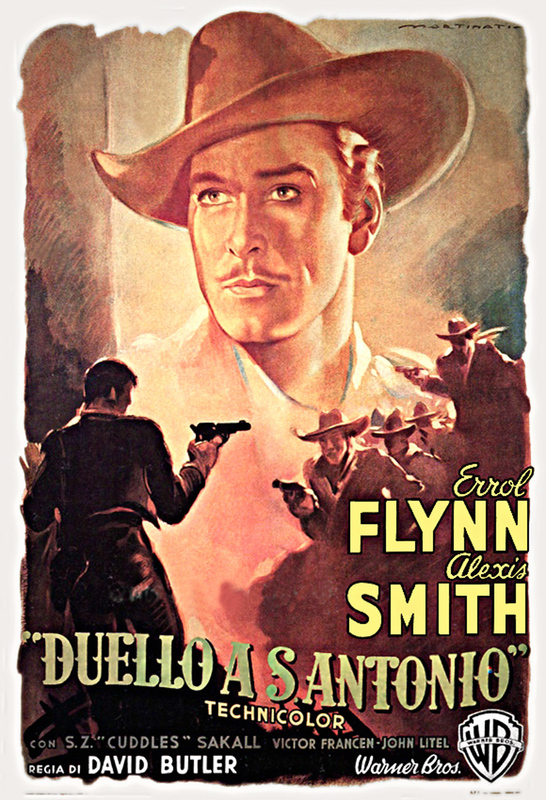 As with other Flynn westerns, this was written by Alan LeMay (author of the novels on which The Searchers and The Unforgiven were based) and W. R. Burnett (Yellow Sky, This Gun for Hire, High Sierra and the novels of Little Caesar and The Asphalt Jungle). Clay Hardin (played by Flynn; his name could just as easily have been John Wesley Allison) is a San Antonio-based cowboy in post-Civil War Texas. At the start of the movie, he’s in hiding (more or less) on the Mexico border, where he’s been looking for evidence of Roy Stuart (Paul Kelly) running a large-scale rustling operation. 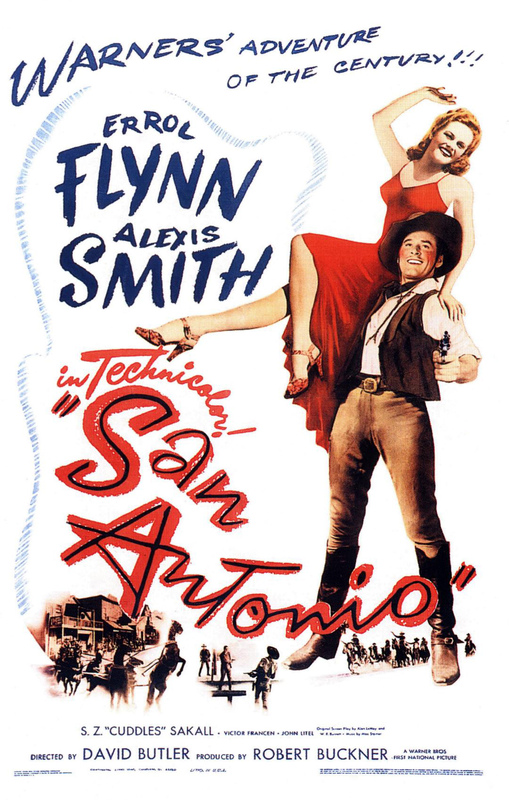 There he meets Jeanne Starr (Smith), a very attractive musical performer heading for San Antonio. He uses her for cover to sneak back to San Antonio himself, with the help of his long-time friend Charlie Bell (John Litel). On the stage back to San Antonio. In San Antonio, Hardin makes clear to Bell and his friends that he has a tally book which shows Stuart’s rustling, and he further develops his relationship with Starr. Bell is killed and the tally book stolen by Stuart’s partner Miguel Legare (played by sinister Belgian Victor Francen). As Hardin finds out who killed Bell and as Stuart tries to kill Hardin, there is an improbably large shootout in the Bella Union saloon (bodies falling scenically from balconies and one bad guy is even run over by a piano). Hardin’s near-final confrontation with Stuart takes place in the supposed ruins of the Alamo. And Hardin and Starr get together as expected, although it’s not clear that Stuart is either dead or in jail. 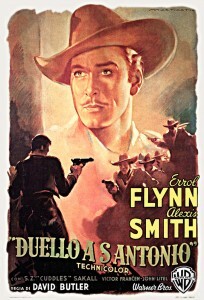 Worth watching, perhaps, but not as good as Dodge City (1939), Virginia City (1940) or some of the other seven Flynn westerns. This, Rocky Mountain and Montana are the least seen of them. 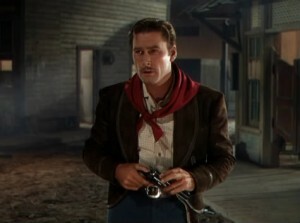 Clips are sometimes shown of Flynn walking with a curiously stiff-armed gait toward a shootout; in close-ups he’s starting to show the physical effects of his dissipated lifestyle, and he’s coming to the end of the period of his best work. Smith is tall and elegant, with excellent 1940s shoulder pads. Sakall as Starr’s manager and musical director Bozic is less effective here than in other roles. Flynn, Smith and Sakall would be teamed again five years later in Flynn’s last western, Montana (1950). The song “Some Sunday Morning,” written for this film, is sung by Alexis Smith and was nominated for an Oscar. It went on to be a hit for various singers in the 1940s. On its original release, this was Flynn’s highest-grossing movie. 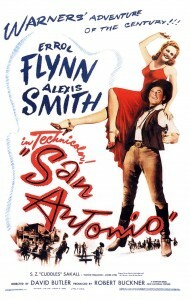 Music was by Max Steiner, who reuses his theme from Dodge City over the credits here. In color, with excellent cinematography by Bert Glennon. This entry was posted in Westerns Worth Watching and tagged Errol Flynn, Range Wars on February 17, 2014 by Nicholas Chennault.